Many Americans worry that retirement will bring not leisure, but financial hardship. Unfortunately, their fears are valid. More than 25 million Americans aged 60+ are economically insecure, living at or below 250 percent of the federal poverty line. Maintaining economic security is a real problem to contend with as we age. Social security will only help so much, with the program expected to pay out only 79 percent of benefits by 2034. This leaves a huge shortfall in meeting the retirement income needs of millions upon millions of Americans––a shortfall that will need to be met from individual retirement savings. So what options do you have for turning your nest egg into lifetime income you can’t outlive? Each and every day, baby boomers are reaching out to explore the Fixed Index Annuity, uncovering the truth behind this often-criticized retirement income generator. We’re here to tell you that while critics are important to keeping any system in check, they’re not always on the ball when critiquing solutions they might not be experts on. 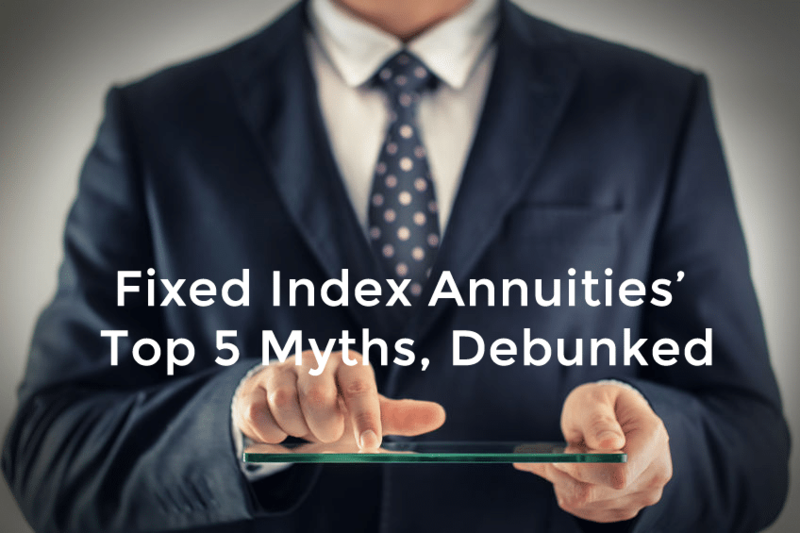 These are the top five myths about fixed index annuities (FIAs) and why they’re only good for scaring money-savvy folks out of what could possibly be a smart, most hard-working component to their retirement income plan. We’re not really sure how this misinformation started, but it couldn’t be further from the truth. The very nature of fixed index annuities means that they’re a near zero-risk path* towards generating retirement income. With fixed index annuities, your principal is one hundred percent protected from stock market loss, including any gains made over the life of your contract. On top of protecting your principal, FIAs are designed to earn money in good markets and bad. Fixed index annuities work around something called a minimum rate of return. It makes sure that in years of stock market decline, you’ll receive a fixed guaranteed rate of return. When the markets are good, you have the opportunity to earn more than your contractual minimum rate of return without any downside risk. Be sure to sign up for our video series to learn how fixed index annuities earn money. *An annuity is backed by the full faith and credit of the insurance company that issues it. Most insurance companies also purchase “reinsurance” to provide further safety. In addition, each state offers additional protection up to a specified limit. When choosing an annuity, it’s important to go with top rated carriers and deal with the experienced annuity professionals at Annuity Watch USA. You may find helpful links to Insurance Carrier Ratings Agencies in the “Resources” section of our website. Fixed index annuities can work for people facing a wide variety of retirement planning scenarios. The lifetime income component is especially important to individuals in or near retirement. But they can also be a smart option for younger professionals looking to shield a portion of their portfolio from stock market risk while still benefiting from upward stock market movement. The money contributed to a fixed index annuity also grows tax-deferred until it’s withdrawn, which may lower your overall tax exposure. Fixed index annuity basics are very simple to understand. In exchange for a lump sum payment, an insurance company promises to pay you an income stream for as long as you live. You can choose to begin receiving income immediately, or you can choose to defer payments until a predetermined date in the future. That’s about as simple as it gets. There’s a reason why these accounts are on the rise. In fact, they’re experiencing so much growth that in the second quarter of 2016 fixed indexed annuity sales reached $16.1 billion. Sales are expected to continue apace, meeting the income needs of individuals and families seeking more security in retirement. What can be complex are the details outlined in your contract. That’s why educating yourself about your options is so important, and why working with an expert is imperative. This is a valid concern. Money left over after you pass should go to someone you love. Luckily, this is possible with fixed index annuities. All you have to do is make sure to select a plan that allows for a beneficiary. For annuities that offer an immediate income stream, if you pass on before the full contract value is paid out, your beneficiary will receive any remaining principal in your account. On deferred annuities, the death benefit includes any money left in the contract, plus any interest that has accrued prior to death. You have the option of purchasing contract riders that increase the death benefit of your annuity. Everyone’s portfolio makeup and retirement needs are different thus we are not here to argue what is truly “necessary” or “unnecessary”. We can only point out a bare-bones fact: retirement accounts like 401ks are set up as savings vehicles. They are not guaranteed income generators––most certainly if you are looking for a guaranteed income stream you cannot outlive. The number one feature of an FIA—providing predictable guaranteed lifetime income—is non-existent in other retirement income strategies. On top of providing income you can’t outlive, fixed index annuities provide a distinct combination of advantages including principal protection, tax-deferred compounding, and death benefits. Including an FIA in your portfolio can deliver a wealth of benefits, either providing the bulk of your retirement income needs or supplementing your overall approach to wealth creation and preservation. We’re living in a world with ever-evolving and changing financial markets. We believe that annuities are a smart path to ensure that you’ll spend your retirement relaxing, and not worrying about stressful financial situations. If you’re looking to explore your retirement planning options, consider learning more about our services.